Conductor: Shoelace tying, it’s an art! One of my favourite activities is showing clients, young and old, how they can learn to tie their shoelaces. In the summer I had been given a gift token for the cinema. I do not like to go to the cinema alone so when I saw my downstairs-neighbour I told that I would like to invite her to come with me if she ever noticed that there was a film showing that we may enjoy together. Several months ago she had asked me whether I would go the film Untouchables with her and this time she soon came up with just the film for me. Even the title was right up my street although she did not know that way back in 2009 I had posted something here on my blog about the art of shoelace tying. We made a gallant first attempt to watch the film on Sunday afternoon but were turned away at the door due to a dysfunctional neighbouring toilet that had turned the small cinema into something reminiscent of a pigsty! Reluctantly, at first, we left the building then took ourselves off to the beer festival that that was taking place across the river next door rather than waste the cinema tickets on a film that we really did not want to see. While we sat with a pint of beer between the two of us and watched the real-life film around us, we drew up plans to find time in the middle of a busy week to make a second attempt at watching our chosen film. My neighbour said that it would make a good distraction from work but I was not so sure about that. The subject of the film seemed a bit like bringing coals to Newcastle, but it turned out to be very entertaining and offered much food for thought. It also reassured me that I am certainly in the right job and I learnt a lot from it too. This week I have been attempting to find a way to take a group of people from our association to the film. We would like to take the people who live independently in their own flats on a trip out, perhaps even fill the whole cinema as an advertising and publicity campaign between us and the cinema chain. After the word bagoly, cipőfüző is my all time favourite Hungarian word. Both words just roll off the tongue, with difficulty, and appear to have no meaning or purpose other than to make one smile. Most of the children in our group have Velcro fastenings on their shoes so we have to find other ways other than "real life" to learn to tie shoelaces. 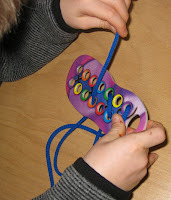 We have a game where each person gets a cardboard shoe and a dice with coloured spots is thrown to see which colour shoe gets to thread the next hole. There is an accompanying story book which is all about a little boy called Lucas who is also learning to tie his shoelaces at the same time as us. Teaching children to tie shoelaces is one of the things that I love best and there is no need for a game and a story book. There are so many funny stories to make up, about snakes weaving their way around trees, or rabbits jumping in and out of holes, never escaping from sight because of their long ears, tales of fairies passing magic spells on knots that never come undone. We get lost in a faraway land of strange folk and animals that all seem to have moved into this shoe that we are working on. It is lovely and it could, if we let it, take over the whole day! Thanks for taking the trouble of indexing your blog. This will be a great help to your users but it is also extremely interesting in pointing to the upbringing emphasis of what you write, and the dangerously neglected upbringing dimension of Conductive Education. ‘…you must walk with left foot forward, right hand up and alternate. Interesting to see how difficult this is for children with cerebral palsy. It takes lots of correcting and concentration. Cassie spent a lot of time doing this type of therapy and she really excels in this program. No one can object to exercising skills learned and exercising the body, but teaching such skills in the first place, that takes pedagogy, and this posting of yours, on shoe laces, clearly illustrates the difference. More, however, it also shows the wider world of upbringing into which such pedagogy should be part, and I can see why you have indexed this posting into your-Upbringing-category. No criticism here, by the way, of the lady writing this blog. We all of us come into Conductive Education weighed down with our previous understandings and this may frame our understandings of what we do, hear, see and experience, sometimes for a very long time. This was certainly true of me and I would guess of you too. Her posting was written only a week or so into the camp. She’ll-learn!-Most-of-us-do. This is the blog I referred to in my last posting, this is the Mum who discovered my blog which triggered me to categorise my postings. It is also because her daughter Cassie and my group were tying laces on the same day that I wrote about cipőfüző at all. It is so important, as you say to ignore some of the language that hurts my ears just as my Norfolk accent hurt the French teacher's ears at school, and to look further. This mum’s blog contains so much information which is invaluable to me. As I read her reports each day I learn more about the needs, and even demands, of families with children with disability. I can then go on to use what I have learnt in my own work. I can begin to mould my "one man band" so I can offer these families something of what they are asking for. As people will know if they already read my blog I am very interested in language. I love looking at people's blogs for the sense of what is going on there. I get to this I hope because I have my own strong sense of what is conductive and what is not. But I really do fear that people who have little or no such sense, or have the wrong sense, of this, will get hooked on the meaning of what they read and just end up with a very strange understanding of what they call “Conductive Education”. Now I understand her much better. Glad you are interested in reading a mother's perspective on CE. I am not sure I understand the point you are making about my perception of the individual program working between two lines. I have never heard the term "pedagogy" before so this may be why I don’t understand your point. Anyway, it is fascinating to see who is interested in what I write. My blog is a journal for my daughter, myself and our family and friends who are interested in my daughter’s progress here at ability camp. It is also a way to say thanks for the donations raised to support this very expensive camp. I take the pictures of Cassie if the conductors allow me to. I post them if the parents allow me to. There is only a short amount of time that the parents are allowed into the program. In the past Cassie has done extensive amounts of physiotherapy at Chedoke Children's Developmental Rehabilitation program in Hamilton Ontario. She used a Pony walker, regular walker, treadmill, gait training and other methods to learn to ambulate. I only have the Canadian physiotherapy perspective to compare CE with. There seems to be a lot of conflicting views. The conductors don’t support some of the types of therapy that we feel have been very useful for Cassie's growth and development. After five weeks I plan to return to Cassie's rehab program that is covered by Ontario Health Insurance Plan but hope to take home some ideas that we can continue to work on. Cassie's well being is important to her Dad and I. Cassie has had Botox (into thumb and various leg muscles), Serial Casting recently before coming to camp. She has used a left AFO and a SMO on her right since 6 months old. She pretty much wears them from morning until night and often wears her AFO and a knee immobilizer at night. I have learned to stretch her and I have learned to mobilize her calcaneous. (To assist with her problem of walking on the outside boarder of her foot.) It is an evolving process where things look great, she grows and things look worse. We have invested huge amounts of time in various therapies for her hand. Focus on Function study, Constraint induced Movement Therapy, therapeutic horse-back riding programs, and she loves ballet and swimming. I believe children need to be well rounded and too much therapy is not really what I promote. School, day care, church, theatre camp and girl guides have allowed Cassie to participate and shine and develop well along with her peers. We do not participate in any active therapy programs in the summer. Instead we enjoy fun at our trailer where Cassie is free to play, swim and bike ride with her friends and sister. We give her only small reminders to correct things, or to use her weak hand, during the entire summer. Every child needs this free time and we find it invaluable to her growth and development. Interestingly, I have many pictures of Cassie at her after school physio clinic and she is doing the entire program with her AFO's on. This is very different from her program here at Ability camp. The conductors are working hard to educate me on the dangers of Botox and AFO's as well they do not seem to support orthopedic surgery although they have not commented to me on the surgery Cassie needs. I am still not sure of what is best and may take the best of what I can remember from each type of therapy. I am conflicted as to what are the best options for my girl and I build trust with different professionals and guide my decisions based on what I think is best. I continue to put her AFO back on her left foot after her class here. Cassie loves to run a lot and runs better with her left foot supported. I have a terrific orthotist who invests a lot of time, and a great deal of skill, watching Cassie ambulate. Constant adjustments are made to her AFO's. I still may consider allowing a surgeon to correct her equinovarus foot deformity if the stars align and Cassie works hard and continues to improve her muscle tone problems. I would love to prevent the need for surgery however. It is a continual balancing act. The planned surgery is club foot surgery and the timing is crucial and her specialist sees her every six months and we work together. Here at Ability Camp the CE conductors are presenting me with other options that are empowering and important to me. Yesterday Cassie saw a chiropractor who may be able to assist with her leg length discrepancy and twisted foot. The lack of written material here at camp makes it slower for me to grasp and remember what is said. Yesterday Cassie walked down the hall in orthopedic shoes that are too big (borrowed and put on her by conductors). Although I don’t like the look of her foot I do not say anything as I respect what they are doing and came here to learn their ideas. Cassie's left foot is rolling over badly as I watched her run down the hall back to her CE class. I am interested in reading a lot more information before I give up on some of the medically managed ways of controlling Cassie’s spasticity and poor muscle tone. I don’t believe the amount of therapy she gets at home would ever allow her to be without AFO's without a huge commitment on my part. Until Cassie is old enough to make her own decisions I must balance out what I feel is best for her. I am a busy RN, mother and wife. I am just learning CE and yes I relate it to exercise or physiotherapy because it is what I am familiar with. Cassie invested huge amounts of time into constraint induced movement therapy which I also support but unfortunately she loses what she has gained after she goes back to doing what is easiest for her using her strong right side. I have no doubts Cassie will make gains with an intensive program like CE because she makes huge gains in every program she participates in. I am glad I linked to Susie as there seems to be a lot of good information on this web site. The internet is how I found Ability camp. Keep organizing the web site Susie, if I can find the info I am looking for easily I am more likely to read more. The camp here has no written material which I find strange. Like a lot of mothers of children with CP I am always overloaded, I lead a hectic life. I have slowed considerably these two weeks because I am away from home. My first two weeks at this camp I have loved what I have seen and more importantly my daughter is having a fun, enjoyable time and she seems eager to do the program. This is what truly matters to me. I excitingly await more responses from others and love sharing information. HAVE YOU NOTICED OR LEARNED AT THE CAMP WHAT YOU CAN APPLY WHEN YOU GOING TO BE BACK HOME. CAN YOU DESCRIBE IT.? Jerzy, this is exactly what I have hoped to convey in some of my previous blogs. The children work so incredibly hard at camps, conductors too, but what for? Otherwise children may become despondent and parents may begin to feel that they are not good enough. I also one of the person who is trying them wrong. I always couldn't keep the laces tied, so I have to fasten up several times a day. At first, I also this subject seems ludicrous and I felt just interesting and useful story while I watching it.